Bees are in big trouble. For nearly a decade, bees in the US, Europe and elsewhere have been dying off at an alarming rate. If you like eating, this is a big deal. That’s because bees and other insects are responsible for pollinating most of our food, from nuts to tree fruit to beans to squash and a whole lot more. In fact, 84% of the crop species grown in Europe rely on insect pollinators, with a similar percentage in the US. 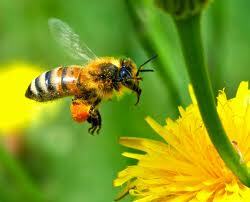 Globally, 87 of the 124 crops used directly for human consumption are dependent on bees and their other winged buddies. This week, the European Commission voted to enact a two-year moratorium on the world’s most widely-used class of pesticides after a growing body of scientific evidence pointed toward their complicity in widespread bee die-offs. And while this will buy bees some much-needed breathing room in Europe, American bees are unlikely to get similar help any time soon. I'm a journalist living in Seattle and Europe. This blog is to explore the connections and commonalities between Western Europe and the Pacific Northwest. This entry was posted in Agriculture, Business, Chemicals, Uncategorized and tagged bees, EU, neonicotinoid, pesticide ban, pesticides, precautionary principle. Bookmark the permalink.